Aztec Drawstring Bag Perfect for summer, this brightly coloured bag by Victoria Haynes will fit in all your daily essentials. This available inside issue 104 of Inside Crochet. Not a subscriber? Order a copy online and download a digital edition straight to your smart device. 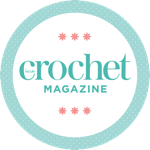 Victoria has been crocheting for almost ten years, and can usually be found curled on the sofa, hook in hand with a huge mug of tea by her side.